Serial killers have long aroused society's curiosity. Recent high-profile cases and intense media coverage have drawn increased attention to this terrifying brand of crime, its shocking criminals, and the details of killers' heinous acts. 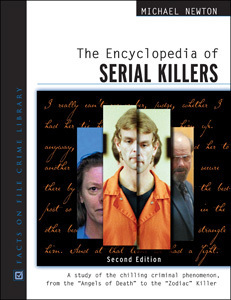 The Encyclopedia of Serial Killers, Second Edition contains comprehensive information on hundreds of serial murderers and murder cases, from early history to the present. Debunking common myths and misconceptions, the encyclopedia avoids glamorizing serial killers and provides accurate accounts of who they are, how they operate, and how law enforcement hunts them and stops them from killing. With more than 250 entries, including more than 60 new and updated, and more than 30 new photographs, The Encyclopedia of Serial Killers, Second Edition is an indispensable reference for students, researchers, and general readers interested in the macabre but fascinating world of serial killers. "Axe Man of New Orleans"
John Edward Robinson Sr., the "Slavemaster"